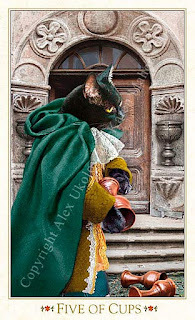 Today's Draw Classic*: Five of Cups from the Baroque Bohemian Cats. Do you feel like life has given you a bum break? Or are you someone who feels pretty good about the life you've got? And are feelings something that happen to you or are they something you choose? The first thought this card brings to me is, "why so glum, fancy pants?" This cat takes "woe is me" to a whole new level of furry, cute, costumed sadness. He's got his whiskers all in a bunch over what he doesn't have, when look at all he does have! He has his health. His good looks. And he's got a fabulous wardrobe that suggests that he's probably got a lot of catnip in the bank. But he's sad about his love life. Maybe his baby-mama has run off with a tabby. Or maybe she's decided to become an indoor cat. Or maybe she's just gotten tired of his endless meowing. In most Five of Cups cards, you'll see all five cups. It's possible the urns on the church doorway are meant to be the other two cups, I suppose. But all we know for sure is that three of his cups are empty. Regardless, the story of the Five of Cups in the tarot is that three are empty, but two are still full. The person or cat in the card is so busy focusing all their attention on the three empty vessels that they neglect to notice or care for the two that are full. I have a couple of things to say about that. The first is that, no matter how bad your tale of woe is, there's someone with a worse one. And since this is true in all circumstances, you have to consider that the people with ultimate tales of woe are either experiencing living nightmares as we speak or, for example, are brains locked inside bodies that won't allow them to scream for help. That's about the worst I can think of. Kinda makes the cat's issues look self indulgent now, doesn't it? Sometimes you don't get this lesson or gain this perspective until you live a nightmare of your own. But mark my words, there's always someone who's got it worse than you. Many someones, in fact. And chances are, the worse off they are, the more they're counting their full cups. The worse things get, the less luxury you have to pity yourself, because you need that energy simply to survive. The second thing I have to say is this—what you focus on increases in your life. Focus on lack and you will increase your plateful of lack. Focus on how unlovable you are (like our cat friend) and you become more unlovable. I mean, the truth of that is plain to see. Who on earth would want to go to the kitty dance hall with this dude? Feelings are not sentences we have to serve. They're choices. Even something like depression is a choice, because there's a whole range of solutions from exercise to medication to treat it. What will you choose to feel today? Will you focus on the empty cups or the full ones? *Adapted from a draw originally posted on 1/9/12.